The Zombie Squad is a young adult horror novel written by Bryce Bentley Summers. Sam, Rylee, Ava and Jordan are attending a special youth leadership conference held in New Orleans. When they get off the plane from Kansas City, they go with Mr. Grant, their chaperone, to a coffee shop where Rylee has arranged to meet her older sister, a medical student. As they’ve arrived early, the four high school seniors decide to go across the street to visit Zombies R Us, a voodoo and magic shop. Jordan’s looking for a natural version of Viagra, which this store doesn’t carry, but the shopkeeper suggests another store around the corner. Voodoo Junk and Magik used to be the biggest voodoo store in New Orleans, but the original store was destroyed during Hurricane Katrina. When they enter the store, the owner tries to get them to leave, claiming the store is closed, and he finally gets the four students to go after filling a bag with touristy items for them. Unbeknownst to them, he’s included a powerful voodoo talisman called the Zombi Astral which a trio of mobsters is willing to kill him for. 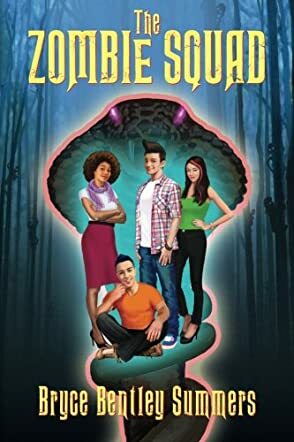 Bryce Bentley Summers’ young adult horror novel, The Zombie Squad, is an original and entertaining take on the zombie novel. Summers creates a compelling voodoo story based on Haitian tradition and weaves an exciting tale in which the four resourceful friends attempt to survive a New Orleans that’s been taken over by zombies. The four main characters are well-defined, and I enjoyed their banter, good-natured digs and loyalty. My favorite character has to be Sam, the gymnast and artist, whose decision to come out led his driver’s ed teacher to flunk him, but whose acceptance by his parents and friends is heartwarming. Datal, the owner of Voodoo Junk and Magik, and his assistant Vic are also marvelous characters. While I am not a huge fan of zombie literature, I was quite pleasantly surprised by The Zombie Squad. I loved reading the history behind the zombie mythology and seeing the sights of New Orleans through the students’ eyes, and found the hotel sequences to be highly imaginative and a visual treat. The Zombie Squad is highly recommended.